The place is a Caribbean island. In their mansion overlooking the sea, the cultivated millionaire Valerian Street, now retired, and his pretty, younger wife, Margaret, go through rituals of living, as if in a trance. It is the black servant couple, who have been with the Streets for years - the fastidious butler, Sydney, and his strong yet remote wife - who have arranged every detail of their existence to create a surface calm broken only by sudden bursts of verbal sparring between Valerian and his wife. There is a visitor among them: a beautiful young black woman, Jadine, who is not only the servant's dazzling niece, but the protegée and friend of the Streets themselves; Jadine, who has been educated at the Sorbonne at Valerian's expense and is home now for a respite from her Paris world of fashion, film, and art. Through a season of untroubled ease, the lives of these five move with a ritualized grace until, one night, a ragged, starving black American street man breaks into the house. And, in a single moment, with Valerian's perverse decision not to call for help but instead to invite the man to sit with them and eat, everything changes. Valerian moves toward a larger abdication. Margaret's delicate and enduring deception is shattered. The butler and his wife are forced into acknowledging their illusions. And Jadine, who at first is repelled by the intruder, finds herself moving inexorably toward him. He calls himself Son, and he is a kind of black man she has dreaded since childhood: uneducated, violent, contemptuous of her privilege. ©1981 Toni Morrison (P)2003 Random House, Inc. Random House Audio, a division of Random House, Inc.
Another great listen! I’m making my way through all Toni Morrison’s books and I’m glad to have listened to this one. Love - Miss Toni & Miss Alfre are dear friends of mine in the higher intelligence of my mind. Would you listen to Tar Baby again? Why? 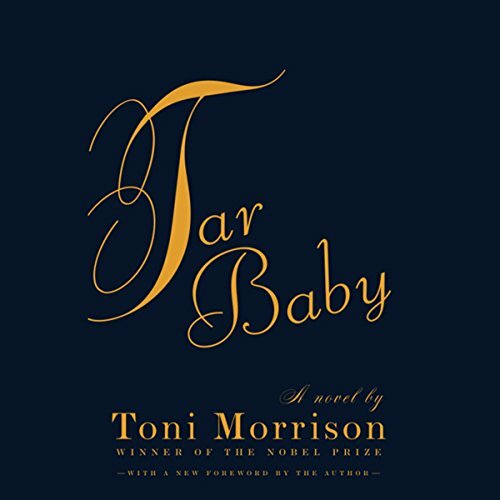 What other book might you compare Tar Baby to and why? The Darkest Child by Delores Philips. Though the stories are different a couple of the characters from each books remind me of each other. What about Alfre Woodard’s performance did you like? Her portrayal of each character, how she changes her voice for each one. She never missed a beat the story continued to flow and you knew who the character was by the change of her voice. Great Performance by her, Ms Woodard was the reason I purchased the audio book, one of my favorite actors. The secret the cook had kept about the lady of the house. I'm an avid admirer of Toni Morrison's work and have absolutely loved all of the previous books by her that I have read. This book was absolutely boring. It took months to force myself to listen to it. Some of the subplots were very undeveloped and led nowhere, just hanging there like untied threads. Basically, everyone just seemed underdeveloped and the book as a whole lacked the depth and character I have come to expect from Ms. Morrison.